Granted, Pixar has not dominated the Best Animated Short feature in terms of wins: the last time they got the golden statuette was with For The Birds, over a decade ago. Of course, sometimes the nomination is enough of a win. Arguably, the prestige associated with the shorts Pixar’s filmmakers create is one of the chief reasons to continue making them; as discussed in this column in the past, there’s very little financial upside to these shorts. The Blu-ray and DVD collection can’t bring in too much money. 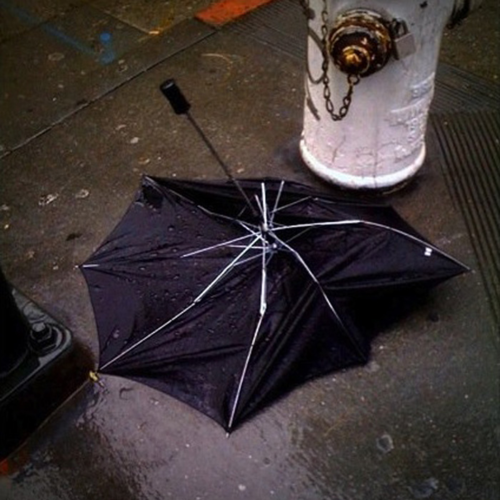 So The Blue Umbrella has been forced to walk away empty-handed from receiving the biggest plaudit of all. Now that we’re a few months away from the short’s wide premiere, and knowing that it won’t be mentioned at the Oscars, it’s time to give it a second look. In the years to come, we may be able to look at The Blue Umbrella as something that pointed the way forward for Pixar, at least technically. But it’s difficult to appreciate the film on more than just an experimental level. To be clear, what makes The Blue Umbrella unsubstantive is not its lack of complexity. It’s hard to see much complexity in any of Pixar’s shorts, subjective reactions aside. Most of them are built around one joke: two men who attempt to one-up each other with Rube Goldbergian musical accompaniment all to get a single coin from a precocious child; a sheep shorn of its wool learns to rebound from his depression by dancing goofily with a jackalope; a rabbit, desperate to be fed, enacts all form of vengeance on his magician master. And so on. The Blue Umbrella has a similarly simple concept: an umbrella (you have three guesses as to what color the umbrella is, and the first two don’t count) falls in love with another umbrella one night in the big, rainy city. As mentioned here a few months ago, part of why The Blue Umbrella seems so unmemorable is a case of bad timing: it premiered nationwide only months after Disney’s exquisite, Oscar-winning short Paperman was unveiled next to Wreck-It Ralph. Sure, Paperman focuses on two humans who fall for each other, but the connections still mount up to a troubling degree: the young woman is defined by her bright red lipstick (a rare shock of color in an otherwise black-and-white short), and the blue umbrella falls for a red one; the male character in both shorts is aided by presumably inanimate objects that essentially deliver him to his potential paramour; and both shorts are notably silent, allowing sugary-sweet music to guide the emotional arc. Most importantly, both shorts are typified by their technique. Paperman was a unique hybrid of both color and black-and-white, as well as hand-drawn and computer animation, something rarely seen before in such a mainstream effort. The Blue Umbrella is equally technically risky, though this time, it’s a risk that doesn’t pay off. Even on a high-definition television, the technical elements of the short are both jaw-dropping and slightly disturbing. What’s most surprising is not, perhaps, that Pixar has finally fallen into the destructive “uncanny valley,” but that the uncanny valley would be a problem in a short that features no actual human faces. The idea of the uncanny valley is intended to refer to the feeling of revulsion we get when we see animated human features that look close to the real thing, but fall short. Certainly, the presence of humanity is visible in The Blue Umbrella—someone has to hold the eponymous character—but we don’t see anyone’s face, a likely deliberate choice on director Saschka Unseld’s part. So how does this short fall victim to the uncanny valley? In short, the presence of humanity in this short’s world is too unnerving, even if we don’t see any single person. The opening shots of The Blue Umbrella depict the rain-streaked city, from its slick roads to its darkened alleys and sidewalks, and the people quickly driving or striding through it. In fact, describing what happens in The Blue Umbrella would emphasize its simplicity; the way those events look uncomfortably real is the issue at hand. After WALL-E, it’s not impossible that a future Pixar film would further blend the worlds of live-action and animation. So a person shouldn’t be faulted for wondering, in those opening moments, if The Blue Umbrella was shot as a hybrid media. For a few seconds, it legitimately looks as if Unseld filmed a real city block, with actual people, umbrellas, cars, gutters, and so on. We have seen the word “photorealistic” tossed about with some of Pixar’s later films, from WALL-E to Cars to Ratatouille, but it’s The Blue Umbrella that exemplifies the best and worst traits associated with that claim. So much of the short looks accurate to real life, or a hyper-extension of real life; many of the shots of the rainy city could be taken out of an Edward Hopper-esque painting like Nighthawks, which have the hallmarks of reality in spite of being a distorted take on reality. So too is The Blue Umbrella distorted visually. On one hand, almost every inanimate object in the film has “eyes” that are built into its design. It’s similar to the way the cars in Radiator Springs have eyes built into their windshields; children imbue inanimate objects with personality and faces like those cars or the rain gutter with screws for eyes in The Blue Umbrella. It makes sense that an animator would let a childlike way of looking at the world guide their artistic ambitions. Conversely, though, there’s the blue and red umbrellas: mostly, they look like generic umbrellas. But then, there’s the eyes and mouth, which look as if they were drawn on haphazardly near the end of production. They are reminiscent, strangely, of one of the recent updates to the It’s A Small World attraction at Anaheim’s Disneyland, wherein a number of memorable Disney characters were inserted into country-appropriate sections of the ride. The last section to include any preexisting characters is supposed to be America, or at least the Western side of the country; the characters representing the nationality are Woody, Jessie, and Bullseye from the Toy Story franchise. As heartening it may be to see these lovable heroes making a cameo in one of the most iconic attractions in Disney theme-park history, the facial design is surprisingly lackluster and almost lazy. There must have been some creative choice for why the umbrellas in The Blue Umbrella have such simplistic, drawn-on “faces;” unfortunately, on the surface, all it represents is a strange decision that robs the short of true charm or sweetness. Again, being clear, whether or not The Blue Umbrella was one of Pixar’s best shorts or a disappointment doesn’t offer an explanation about why it won’t get an Oscar nomination in January. There’s no definitive way to assign the film a qualitative status at that awards ceremony unless you’re an Oscar voter. (Full, unsurprising disclosure: this writer is not one such voter.) However, it is worth considering what has become a common statement in the last few years: even if Pixar’s features have disappointed people, their shorts are typically solid enough to pick up some of the slack. Even when Cars 2 opened to middling reviews at best, it was acknowledged that the attached Toy Story short was charming and funny. Of course, it isn’t the intentional lack of humor in The Blue Umbrella that sets it back creatively, but perhaps part of why this short didn’t have much traction in the lengthy awards season is that the public perception finally shifted. For once, Pixar had not made a short film that was equal to, or greater than, the attached feature. But although it’s not one of the company’s most impressive shorts, The Blue Umbrella may end up having an even greater legacy than one with an Oscar attached. In a few years’ time, this film may be Patient Zero for a new age of animation at Pixar, an experiment that exists to be vastly improved upon technically and otherwise.